China’s Renewable Energy Revolution: What Is Driving It? Alongside its enormous “black” energy system, China is building a renewables energy system that is now the largest in the world. Following our previous articles on this topic in the Journal, we continue to report the latest trends in development of this renewables-based system, again focusing principally on the electric power system, and utilizing three sources of data from Chinese and international sources – capacity data (GW), electrical energy generation data (TWh) and investment data. We highlight that while the Chinese energy system as a whole is shifting in a green direction, at its leading edge (where new capacity is being added, and fresh electrical energy generated) it is turning green very rapidly. This provides a foundation for predicting future directions for the system as a whole, and eventual reductions in absolute carbon emissions. We note that China’s increasing reliance on renewables is consistent with a concern to enhance energy security, based on the observation that renewables are products of manufacturing rather than of extractive activities. China is known as the world’s largest user and producer of coal, and the world’s largest emitter of carbon dioxide and other greenhouse gases. This is China’s “black face”. But less well known is China’s “green face”: the country is building the world’s largest renewable energy system – which by 2013 stood at 378 GW and generated just over 1 trillion kilowatt hours, by far the largest in the world. In terms of generating capacity, by 2013 China’s WWS sources (water, wind and solar) accounted for more than 30% of capacity (exceeding the unofficial 2015 target of 30%) and in terms of electrical energy generated, the WWS total was close to 20% of energy generated — exceeding the combined total of electrical energy produced by the power systems of France and Germany.1 The question arises: what are the drivers and implications of this extraordinary commitment towards renewables? The most recent data for 2013 lends support to Dr Hansen’s assertion, as well as very new data for the first half of 2014. Three sources of data may be drawn on: installed capacity (measured in gigawatts of power); generation of electrical energy (measured in billion kWh or TWh), where different sources are utilized with different capacity factors; and investment data. Together, these sources provide a realistic and multi-faceted assessment of China’s renewable energy revolution, and the progress made in accomplishing the goals laid out in the 11th and most recent 12th Five-Year Plan (FYP) covering the years 2011 to 2015. In terms of installed capacity, China now has the largest electric power system in the world, rated at 1.25 trillion watts (TW), exceeding the US power system’s capacity at 1.16 TW (and German at 175 GW).3 Renewables (water, wind, solar) accounted for around 30% of China’s capacity by 2013, while fossil fuels, mainly coal, still accounted for 69% — it is still a very black system (Mathews & Tan 2014a). The leading edge in capacity expansion is demonstrably getting greener. In 2013 China added about 100 GW of new capacity, of which 58% came from renewable (hydro, wind, solar PV) sources and just less than 40% from thermal (mostly coal) sources. China also added just 2.2 GW nuclear capacity in 2013. So China added more capacity in 2013 sourced from WWS than from fossil fuels and nuclear sources combined.5 In 2014 1H these proportions have dipped slightly, with 20 GW being added from WWS and just 15 GW being added from fossil fuels (or 53% from WWS) – with WWS still a majority of the new capacity added. Installed capacity is one thing; actual electrical energy generated is another. By 2013 China was generating a total of 5,361 billion kWh (or TWh), including 4,196 TWh from thermal power stations and 1056 TWh – or just under 20% – from renewable WWS sources. If the share of WWS in electricity generation continues to increase with its average growth (about 5% per year) since 2007 when China adopted a lower carbon strategy, then WWS would account for more than 26% of the electricity generation mix by 2020. In this case the leading edge is also getting greener. For the year 2013, of the additional electrical energy generated (according to the 2014 BP Statistical Review) year-on-year, amounting to 373 TWh, 280 TWh came from thermal sources and 82 TWh from WWS – or WWS amounting to 22% of new additional energy generated. This is a higher proportion for WWS in additional energy generated than in the system as a whole. Now it is true that large hydro has been the dominant component of this WWS category, driven by huge projects like the Three Gorges Dam. Large hydro accounted for 912 TWh of renewable electrical energy generated in 2013, compared with 132 TWh for wind and 12 TWh for solar PV – but the latter two sources are increasing rapidly. Of the additional electrical energy generated from WWS sources in 2013, more than half came from wind and solar PV. [39.5 TWh for hydro; 35.9 TWh for wind; and 5.7 TWh for solar PV] Solar and wind power are widely anticipated to be the dominant (combined) renewable sources by 2020. The most revealing sign of the renewable energy revolution is from the investment data. Since 2007 the share of investment in renewable electric generation has increased steadily, from 32% of the total in 2007, passing 50% in 2011 and reaching 52% in 2013. Adding the investment in nuclear power, the proportion of investment in all non-fossil fuel-based electric generation increased from 37% in 2007 to 75% in 2013 while investment in thermal power plants declined from 62% to 25%. Here too then investment in green sources consistently outranks investment in fossil fuels and nuclear. We emphasize that we are making a clear distinction between the state of China’s total energy system (in particular the electric power system) and its leading edge of change, as captured in the 2013 full-year data. China’s is a very large electric power system – as noted, now larger than that of the US. In terms of the slow-moving total system, China now has around 20% of its total electrical energy generated sourced from renewables, while around 30% of its generating capacity is built on renewables. (The difference is due to the lower capacity factors of renewable generating sources – themselves improving year by year.) The leading edge is clearly greener than the total system, which is why we can predict the direction of change of the total system as moving towards greater reliance on renewables. The sources that are most widely discussed are wind power and nuclear. In terms of capacity, wind overtook nuclear by 2008, and by 2013 had grown to 91 GW, compared with less than 15 GW for nuclear – so that wind capacity exceeded nuclear capacity sixfold. 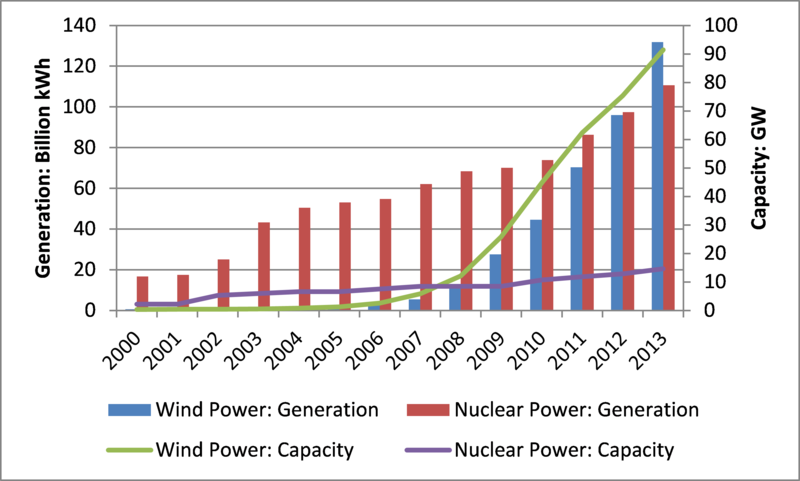 In terms of actual electrical energy generated, wind drew level with nuclear in 2012, and has remained ahead as the preferred source since then (Fig. 1). Fig. 1. Electricity generation: Wind power vs. nuclear in China Source of primary data: the electricity generation data for wind and nuclear and the capacity data for wind is available from the 2014 BP Statistical Review of World Energy; the capacity data up for nuclear up to 2011 are available from the EIA International Energy Statistics database. What are the likely future trends of these two sources? China is allowing the construction of four AP-1000 nuclear reactors by Westinghouse, with the first due to come on-line in 2014 and all four expected to be operational by 2016. The ND&RC envisages a target for growth in nuclear capacity to reach 50 GW by 2017 (generating 280 TWh), by which time wind plus solar are targeted to reach 220 GW. By 2017 the ND&RC expects China to have built 150 GW of capacity in wind power. How much electrical energy is this likely to generate? If we take the historic capacity factor of 20%, this would be expected to generate 255 TWh. But if we take the recently completed Salkhit wind farm in Mongolia as best practice example (50 MW, construction cost $120 million, output 168.5 GWh or capacity factor of 40%) then the 150 GW by 2020 should be adding 500 TWh of electricity in a year – around a fifth of China’s current needs. If we take the mean between these two extremes, and assume a capacity factor of 30% for wind, then the 150 GW target should be generating 375 TWh of electrical energy – comfortably exceeding the amount expected from nuclear. These are the trends in China. Based on China’s abundant wind power resources, McElroy et al (2009) projected that China could build 640 GW of wind power by 2030. This is entirely consistent with recent trends, which have seen a doubling of capacity every two years, and with an anticipated target of 300 GW by 2020. Thus, while we agree with Dr Hansen’s assertion that China is building the world’s largest low-carbon energy system, it is difficult to agree with his follow-up assertion that China can only continue to do this by relying on nuclear power.8 On the contrary, China appears to be banking on a variety of low-carbon sources for its energy revolution – with the capacity to build a system based on manufacturing that can scale to grow with the country’s expanding economy, without impinging too aggressively on other countries’ fossil fuel resources. The common assumption is that it is concern over climate change (global warming) that drives China’s shift to renewables. Carbon emissions are certainly a topic of great concern to the Chinese leadership, as well they should; statements going back to 2009 and the Copenhagen conference indicate that by 2020 China is aiming to reduce carbon emissions as a proportion of GDP (carbon intensity) by 45% from 2005 levels. Our calculations shown in Fig. 2 reveal that this appears to be a realistic target. Figure 2. China’s declining carbon emission intensity with target set for 2020 Sources of primary data: Carbon intensity data up to 2010 is available from US EIA; carbon intensity figures in 2012 and 2013 are estimated by authors based on the real GDP growth data available from Euromonitor and the carbon emissions data from BP 2014Statistical Review. 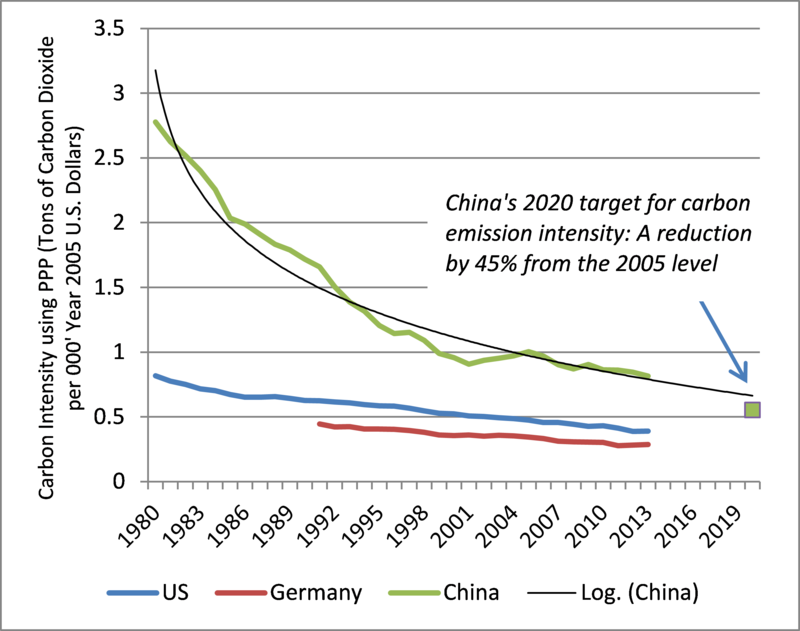 Important as this motive of reduced carbon intensity might be, we believe it is the least likely of the explanations for China’s shift. We believe the more plausible explanation for China’s new trajectory – and for the determination with which it is being pursued – is energy security (Mathews & Tan, 2014b). All countries face a choice between, on the one hand, continued reliance on fossil fuels, with their geopolitical implications, including threat of military entanglements, and on the other an increasing reliance on renewables, which are based on manufacturing activities. So long as China is able to tap renewable sources of energy for manufactured devices to work on (solar and wind energy) it appears that it would be able to generate superior energy security through renewables than it would through continuing (or deepening) its reliance on fossil fuels. This appears to be well understood by the Chinese leadership. It is also reflected in China’s broader goals to reduce dependence on fossil fuels (particularly oil) in the transport sector, by increasing reliance on high-speed rail systems (where China leads the world) and on electric vehicles, including the charging infrastructure for EVs. These are seen as highest priority national infrastructure goals in China. Manufacturing is the platform upon which China’s shift towards low-carbon sources of energy (and renewables in particular) is based, which in turn provides a platform for reducing costs due to learning curve effects. While the US is swinging behind an “energy revolution” based on alternative fossil fuels (shale oil, coal seam gas), China is clearly shifting towards greater independence of extractive activities and greater reliance on manufacturing for its growing appetite for power supplies.11 Manufacturing generates increasing returns, and can be expanded almost indefinitely – particularly if it works off recirculated materials, consistent with China’s goal of building a Circular Economy. By contrast, extractive activities are faced with eventual diminishing returns. This is why China’s swing towards renewables is good for China, and for the world. Their article “Economics: Manufacture renewables to build energy security,” appears in Nature, Vol 513, Issue 7517, 10 September 2014; their article “The Transformation of the Electric Power Industry in China” appears in Energy Policy, Vol. 52, January 2013. Recommended citation: John A. Mathews and Hao Tan, “China’s renewable energy revolution: what is driving it?”, The Asia-Pacific Journal, Vol. 12, Issue 43, No. 3, November 3, 2014. Hong, L., Zhou, N., Fridley, D. and Raczkowski, C. 2013. Assessment of China’s renewable energy contribution during the 12th Five Year Plan, Energy Policy, 62: 1533-1543. McElroy, M.B., Lu, X., Nielsen, C.P. and Wang, Y. 2009. Potential for wind-generated electricity in China, Science, 325 (11 Sep 2009): 11378-1380. Malakoff, D. 2014. The gas surge, Science, 344 (6191) (27 June 2014): 1464-1467. Mathews, J. A. and Tan, H. 2014a. China’s Continuing Renewable Energy Revolution: Global Implications, The Asia-Pacific Journal, 12(12). Mathews, J. A. and Tan, H. 2014b. Manufacture renewables to build energy security. Nature, 513 (11): 166-168. Yuan, J., Xu, Y., Zhang, X., Hu, Z. and Xu, M. 2014. China’s 2020 clean energy target: Consistency, pathways and policy implications, Energy Policy, 65: 692-700. 1 In 2013 China produced 1056 billion kWh of renewable electrical energy, from hydro, wind and solar PV sources. In the same year Germany produced 579 billion kWh from all sources, and France produced 476 billion kWh from thermal and nuclear sources – giving total electrical energy produced in France and Germany of 1055 billion kWh, or what China produced from renewables alone. 2 See James Hansen, “Renewable energy, nuclear power and Galileo: Do scientists have a duty to expose popular misconceptions?”, 21 February 2014, here. 3 It is worth noting that US data is for “net” electrical energy generated, while for China it is “gross” energy generated. The difference is minor, amounting to around 5%; in any case thermal power stations use more electrical power (to load fuel supplies, remove ash and monitor operations) than renewables devices. 4 Note that the Chinese leadership appears to have “capped” the expansion of coal consumption at 3.5 Gt – with important implications for carbon emissions. 5 See also Mathews & Tan (2014a). 6 For recent scholarly discussion of China’s progress in the energy sphere, see Hong et al (2013) and Yuan et al (2014). 7 See the statement (in Chinese) here. 8 In his 2014 testimony to Congress, “Climate and Energy: Fundamental facts, responsibilities and opportunities,” Dr Hansen asserts: “Non-hydro renewables provide only a tiny fraction of global energy and do not appear capable of satisfying the large energy requirements of developing nations such as China and India.” See James Hansen, Testimony to the United States Senate Committee on Foreign Relations, 13 March 2014, here. 9 Christina Larson was certainly on the mark with her comment on the paradox of China’s “green energy and black skies”. 10 See “Beijing to ban coal use to curb pollution” (5 August 2014), here. 11 In the US, dependence on fossil fuels is being prolonged by the revolution in alternative fuels production, particularly coal seam gas and shale oil (Malakoff 2014). Overall, US generation of electrical energy from WWS sources has grown from 7.1% in 2003 to 10.6% in 2013, in a fairly even progression (Fig. A2 in Supplementary material). The shift to dependence on renewables has been much more pronounced in China.